Welcome to Mythe Medical Practice, a GP practice formed from the merger of Watledge Surgery and Jesmond House Practice. 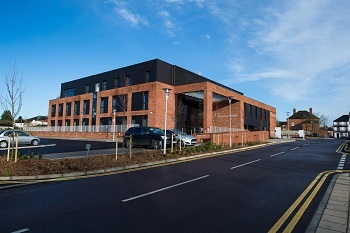 We are a friendly and approachable doctor, nursing and admin team, rated as 'OUTSTANDING' by the CQC and based in a new purpose built medical centre opposite Tewkesbury Hospital. Our dedicated team is here to help and treat you in a friendly and supportive manner. We offer a full and comprehensive range of general practice services. See link below to our Inspection Report. We have now been situated at The Devereux Centre since March 2017. There is accessible parking available for patients at the new Centre and a drop off point right outside the front door. However, all other parking is allocated to the Doctors and Staff of Mythe Medical Practice and Church Street Medical. There is a car park at Rails Meadow (on Howells Road) just behind The Devereux Centre. The Practice will close at 20.00 on Thursday 18th April and reopen at 08.00 on Tuesday 23rd April. If you require a GP urgently during this time please telephone the surgery which will automatically transfer to the Out of Hours Service. We recently informed patients that we had welcomed two new Partners, Dr. Mike Crisp and Dr. Caroline Butler. Sadly Dr. Paul Wainman has resigned from Mythe Medical Practice following a period of extended sick leave. We wish him well for the future and would like to assure his patients of continued excellent health care at the Practice. Some patients have, during Dr. Wainman's absence, moved across to another Partner, but for those patients that are still on his list, Dr. Butler will be taking over their medical care. NHS England has issued guidance to help reduce the prescribing of over the counter (OTC) medicines for minor and short-term health concerns which could save the NHS millions of pounds a year and encourage people to self-care. The Practice has produced a leaflet which explains all about these changes - you can download from the link below or pick up a copy when you visit us. We are pleased to announce that we have two new members on the Practice Team - Paramedics Andy Grant and Cairen Stedman are working with both Mythe Medical Practice and Church Street Medical as part of a new project which is being replicated across the county. Andy and Cairen are extremely experienced Specialist Paramedics who are now working in the community and supporting home visits with supervision and oversight of the existing GP Team. Appointments are pre-bookable but please note there is no telephone access to the surgeries after 6.30 p.m. Monday to Friday or at weekends when the countywide Out of Hours Service takes over. The Newent and Staunton practices will also be offering similar availability. We hope that our patients will find this increase in access helpful particularly those people who need to book appointments outside of normal working hours. You can also find us on Facebook and Twitter. Follow the links below to keep up to date with our latest news and remember to 'like' and 'follow' us! "Fabulous doctors - proud to have the practice in Tewkesbury. Each time we go there, we have an excellent experience. The doctors are really attentive and kind to the children and listen carefully to me as a mum. Really happy with the service and the new surgery building is fabulous."